SNAFU! : Lazar 3 enters service. 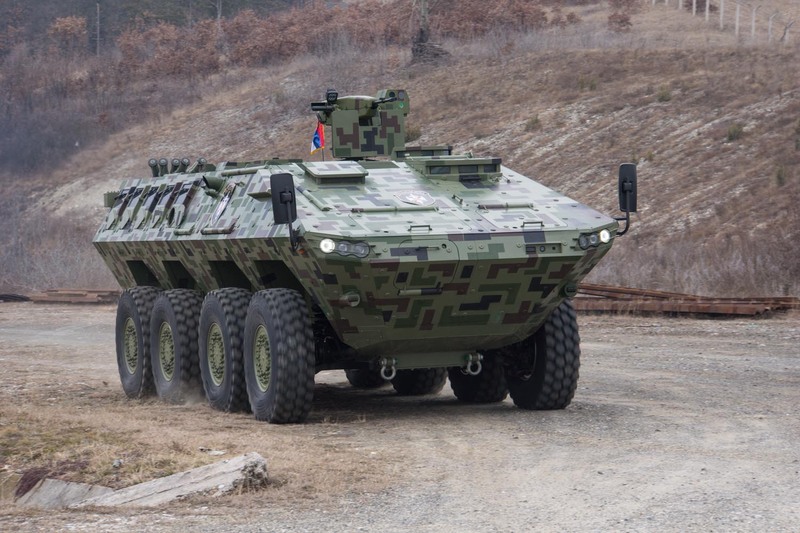 Yugoimport's Lazar 3 8x8 MultiRole Armoured Combat Vehicle has entered service with Serbia in the armoured personnel carrier (APC) configuration. The vehicle has a welded steel chassis to which its monocoque steel hull - which features spall liners - is bolted. In its baseline form the vehicle has all round ballistic protection to Standardization Agreement (STANAG) 4569 Level 3, and over the frontal arc this is increased to Level 3+. Mine protection is to STANAG 4569 Level 3a and 3b, and the floor has two levels of protection. An appliqué passive armour package has been developed and tested that increases all round protection to STANAG 4569 Level 4, and over the front to Level 5. This is why I love Janes and Christopher Foss. They have an ear to the ground for those relatively obscure/small armor programs that escape the notice of many. The LAZAR is an interesting vehicle and Yugoimport is a fascinating little company. The vehicle has been thru a steady modernization cycle and the company is keeping up with the big boys. It seems like a capable rig....perfectly serviceable.